There isn’t a magic formula for mapping out a career in law. You will make some decisions on where you would like to go, but there are many things outside your control which will impact where you end up. Factors such as economic conditions, personal circumstances, and even a bit of luck will affect the career path you will follow. Some law students have a very strong idea about the area of law they ultimately see themselves practising in. Other students may have no idea, or perhaps an idea of areas of law they would prefer to avoid. Your thoughts may change as you go through law school. Whether you already have an articling position, an LPP placement, or are still searching, it is worthwhile to spend time organizing your thoughts about the direction you would like your professional life to take. This can help you make better choices. This article outlines some tips and self-assessment questions that will help you find your way to a satisfying and successful legal career. 1. Honestly assess what makes sense for you. Regardless of what stage you are at in law school, you may have an idea of where it is you would like to end up. That could be in Toronto at a large Bay Street firm, a sole practitioner in a small community, or somewhere in between. When it comes to areas of law, work hours, working environments, types of work, remuneration and many other factors, Bay Street lawyers, smaller firm and solo practitioners live in very different worlds. Ask yourself what makes sense for you. This is a very personal question. Be honest – very honest. You will be happier and more successful if you can find the place where you best fit in. Do your best to figure out where that is. 2. A quick review of the options: In Ontario there are nearly 27,000 lawyers in private practice (i.e. lawyers who work at a firm serving clients). The largest firms have several hundred lawyers. The smallest have a single lawyer. A job at a large firm may mean a bigger salary, and in some cases, a bigger time commitment. Some lawyers enjoy and thrive in the big firm environment, others do not. One-third of the lawyers in private practice work in sole practices and one-third work in firms with just 2-10 lawyers. There are a few thousand Ontario lawyers that have a corporate or “in-house” position. And while it is probably not something that many students contemplate as they are in the midst of working hard to get through law school, ultimately the realities of practice or other personal circumstances cause some to leave private practice and even the legal profession. 3. Create a list of options: Where do you want to go? Consider your preferences and what you think makes sense for you. Write out a list of your options. Your list should include the most desirable options as well as others you might consider if your preferred choices do not work out. Think broadly and keep alternatives open. You may have specific firms in mind, but you should keep an open mind and include groups or categories of firms that would be of interest. 4. What makes you unique? Every law student is unique, and the key to selling yourself is to tap into your own uniqueness. To do this, consider the work and personal experiences you have had, the education and training you have completed, and any other skills that you have learned before entering law school. Identify what makes you stand out from the crowd. This will let you sell yourself with more confidence and will also help you make choices about job opportunities that are the best suited to your abilities and preferences. 5. Do you have what it takes to be a sole practitioner? One-third of the nearly 27,000 lawyers in private practice in Ontario are sole practitioners. As a solo, it’s great to have the freedom that comes with being your own boss, but you also have full responsibility for all aspects of the operation of your law practice. Do you have what it takes to be a sole practitioner? Are you ready for sole practice? This survey helps identify your strengths and weaknesses and gives you a better idea of whether you’re cut out for solo or small firm practice. 6. A dose of reality -The job market: After you have determined what you think your preferred career path will be, you need to consider the job market. 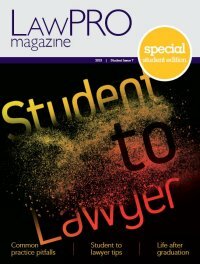 Finding an articling position or post-articling job may be difficult right now, although the introduction of the Law Practice Program in 2014 expanded the options for students. Unfortunately, you may end up taking a position that will not be your ideal in terms of size of firm, area of law or geographic location. These factors are beyond your control. You will need to work with them and make the best choices you can in the circumstances in which you find yourself. 7. Be prepared to deal with uncertainty: Making decisions about your career path when you are a student is not easy. There is a great deal of uncertainty as there are many choices and limited information on which to base decisions. This uncertainty is compounded by many factors and unknowns beyond your control. You will not be able to eliminate uncertainty. Accept that there is an element of risk and chance. Work to gather all available information and make the best decision you can in the circumstances. 8. Be ready to adapt: After you have assessed your preferences and mapped out your options, you should have an idea of where you want to go and what you need to do to get there. However, your personal circumstances and external factors can change. Make sure you consider new or changing circumstances and be alert for new opportunities. Your preferred path may change based on your articling or LPP placement experience or the work you end up doing in the early years of practice. 9. Prepare your resume and supporting documentation: Prepare the bundle of information you will use to sell yourself in interviews. This includes a resume that highlights your background and why you are unique – remember, you want to stand out from the crowd. If you have them, collect writing samples to show your work. Identify your references and contact them for permission. 10. Contacting potential employees: Contacting potential employers takes some legwork. Start with your most preferred options and work down your list. Go online and review firm websites; talk to friends and colleagues to get information about the firms you are considering. An inside introduction can help, so look to see if you or someone you know knows someone at any of the firms that interest you. 11. For lawyers and students the process of networking is aimed at increasing your contact with individuals who may be clients, know about career opportunities, help open doors, or provide support. Networking involves developing new contacts, as well as tapping old ones. Informal channels can also help with networking, and even with finding a job. 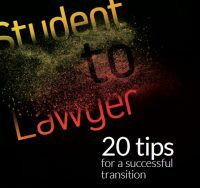 Many law students initially think they do not have “contacts” in the legal profession. Don’t sell yourself short. If you are active on social media you already have a network that probably includes people from the legal world or people that are connected to people in the legal world. If you aren’t on social media, you can create a network with minimal effort. 12. Making a good impression at a job interview: When it comes to getting a position, making a good impression is critical, both in your articling and LPP interviews and in any future interviews you might do. You can make a positive impression with good answers to the many difficult and awkward questions that will be asked of you. These questions are often fairly standard and you can and should prepare answers for them. Click here for questions you can expect to be asked at a job interview at a law firm. Get clear instructions and all required information: Make sure you understand the specific issues of concern, but also look to appreciate the bigger picture so that you understand the reasons behind the work that you are doing. Get direction on any special parameters: Ask the person giving you the task if there are any parameters that will limit or direct what you are to do to complete the task. Are there resources to use or to avoid? How much time is to be spent on the task? Are there any cost sensitivities on the part of the client with respect to the amount that will be billed for the work? Get a realistic deadline: Most tasks will come with a deadline attached to them. Make sure you are aware of the deadline and that you can realistically meet it given the other tasks for which you are responsible. Talk about alternatives if the deadline is unrealistic given other deadlines you are facing. Understand the reporting mechanism: Are you expected to simply return the completed work, or are you to check in with updates as the work progresses? Confirm the instructions given to you: At the end of your discussion, reiterate the instructions given to you to make sure you properly understood them. Ask about anything you don’t understand or are confused about. Ask for feedback when the work is done: Getting feedback is key to learning, especially if there were mistakes or complaints about the work. Hopefully any criticism given to you will be constructive criticism. 14. Good client communication is essential: Start off on the right foot in your dealings with clients. LawPRO statistics indicate that four in five lawyers will have at least one malpractice claim during the course of their career. The most common malpractice claims don’t involve a failure to know or apply the law – errors of law lead to only about 13 per cent of the claims LawPRO sees. Lawyer/client communication issues are the most common cause of claims, accounting for more than one-third of the claims LawPRO handles. These errors arise due to poor communication, miscommunication, or no communication whatsoever. Take the time to develop good interpersonal skills and to implement sound client communication practices. 15. Get a mentor to improve your skills: Mentoring is one of the most effective ways to gain skills, knowledge and wisdom about many topics that are not taught in law school. See It takes a village to build a lawyer to learn more about using mentors in your career. 16. Make time for marketing: Some lawyers find rain­making very natural and easy, others struggle with it, and some are oblivious to the need to market their services. In today’s competitive environment, marketing and client development are essential. Marketing legal services does not lead to instant results. Not everyone needs legal services at the moment. Good marketing does pay off, but generally only slowly and with a steady effort over the long haul. Therefore it is critical that you market yourself on an ongoing basis, even when business is good. Most law firms of any size will have some kind of formal marketing and business development plan. As an articling student there are some marketing-type activities that you can undertake to foster positive relationships with the clients you are dealing with. You will have to work within the parameters of any existing plan. Take at least one current client, potential client, or potential source of referrals out to lunch (or just for a coffee). Send a handwritten thank-you note any time you: close a client file; receive an introduction or a referral; or receive any kind of advice, assistance, or support that goes beyond the call of duty. Post articles on interesting legal topics to social media along with comments explaining their importance. Attend at least one civic, service, or community meeting. Try to add at least five new people to your professional contacts list. Make a telephone call to an old friend you haven’t talked to in a while and just chat. Spend some time touring a client’s place of business at no charge to the client. Send someone you know who received some good press a copy of the article and a congratulatory note. Attend an education program and sit with lawyers you don’t already know. Set up a public speaking engagement, or volunteer to help with one on behalf of your firm. Tell your clients about it. Read a book about marketing or law practice management. Host a social event or arrange a get-together. Do some volunteer work for the Law Society, the Canadian Bar Association, the Ontario Bar Association, or another law association. Schedule a time to review the last four months of your marketing efforts. Send cards to clients and other contacts on their birthdays and during the holiday season. When choosing marketing activities, play to your strengths. If you’re very social, find opportunities for face-to-face meetings. If you’re a written communicator, keep those thank-you notes flowing. Remember that a diverse approach will often yield the best results. Make an effort to try some of those marketing activities that lie outside your comfort zone. With practice, you’ll find that your efforts come more naturally. You’ll also begin to see results. 17. Be nice: You will find that the legal world is a very small one. You will meet hundreds of people through the course of your articling year or LPP placement. This will include lawyers and staff at your firm and at other firms, clients, court office staff and others. You can count on meeting many of these people again through the course of your career, so be professional and courteous with everyone you deal with each and every day. Word gets around, and you never know how the people you interact with today will be in a position to help or harm you in the future. Always remember, what goes around, comes around. Be nice! 18. Have a life: Many legal positions will put great demands on your time, sometimes far beyond the regular 9 to 5 workday. There is nothing wrong with working hard and being proud of the work you do as a lawyer. But don’t neglect the people in your life, and make sure you spend time outside the law office setting! Your partner, kids, extended family, friends and community are important. Make time for them. A strong social network outside the office will make it easier to deal with the stress at the office and can help keep your job in perspective. Sports or other hobbies will let you blow off steam, keep in shape or be engaged with non-legal tasks and people. 19. Take care of yourself: At times you will find the demands of working stressful, as well as physically and emotionally exhausting. You can count on being exposed to high levels of stress on a daily basis. Unfortunately, lawyers exposed to high levels of stress over the long term may misuse or become addicted to drugs or alcohol, and can have challenges to physical or mental wellness. These problems can be contributing factors for LawPRO claims and Law Society complaints. So try to eat right, and get exercise. And if you feel stressed and burnt out, remember there are resources to help you. See the self-assessment tools and resources on the practicePRO wellness page (practicePRO.ca/wellness). 20. Trust your instincts: Throughout your career as a lawyer, there will be highs and lows, good times and bad. Follow your heart and your instincts. Be ready for the unexpected. Many of you will end up in a career that is very different from anything you are expecting or planning for today. It may even be outside the law. Good luck on your articling or LPP experience and with the other decisions you face over the coming months.